The new Sealine C430 is a dynamic and sporty motor boat that is thrilling in design and driving experience. On 43 feet, with up to three double cabins, various technical refinements and visual highlights, Sealine have continued to drive innovation into the range. The hull of the new C430 was developed incorporating latest designs techniques unique to its class. Through the steep stem they have transferred the wave-piercing concept from offshore yachts to a motorboat whereby big waves are cut from the lower part of the stem. This increases the fun factor, comfort and safety at sea. So the WSB have stepped on board to test out this new tech! stiffness which is maintained in all situations. new Sealine C430 becomes the perfect cruising boat. The new Sealine C430 is equipped with two IPS 400 engines from the market leader Volvo Penta. With the joystick control, the boat is very easy to handle in any situation and can be maneuvered into any box in the harbor. The larger IPS 500 and IPS 600 engines accelerate the new Sealine C430 up to 33 knots and guarantee pure driving pleasure. A large glass display on the dashboard shows all information regarding the system and navigation. The full glass windscreen also offers a clear view of the water. Through the Humphrey Interceptor trimming system the bow is kept low in all driving situations. This means not only improved visibility to the front and lower fuel consumption, but also allows a quicker transition from displacement drive to gliding. Driving the new Sealine C430 means power and torque, while enjoying the noble workmanship of the finest materials. The Sealine C430 can be designed precisely for the needs of the owner. The standard layout includes a large master cabin in the center and a VIP cabin in the bow of the yacht. If more cabins are desired, the master cabin can be moved to the bow and two additional cabins are built in the middle of the boat. The VIP cabin on the port side can be optionally equipped with a queen-size bed or two single beds. On request, the 43 feet boat thus accommodates three full-size double cabins. Already in the standard version all cabins are refined with: real slate on the walls, fine leather panels on the beds and soft carpets on the floor. On request, the interior can be finished with noble piano high gloss varnish. opened, the pantry turns into an outdoor kitchen, connecting the exterior and interior to one large loft. Whether sun terrace or evening dinner, the new Sealine C430 is fitted with three lounge areas, providing the perfect ambience for every situation. The stern offers the best location for a barbecue dinner or a wind protected sun terrace with an L-couch and an electric sunroof. On the bow, the reclining and seating areas complement each other, forming an additional lounge. In poor weather conditions the new Sealine C430 convinces with a comfortable U-shaped sofa and floor leveled windows in the saloon, which guarantee a clear view of the sea. Every new Sealine C430 is equipped with the Smart Boat System. It allows the owner to control the systems of his boat via the plotter or a tablet and retrieve information such as fuel level or water temperature. Due to the ultrasonic sensors, installed in the tanks, all tank contents are displayed exactly to the point. 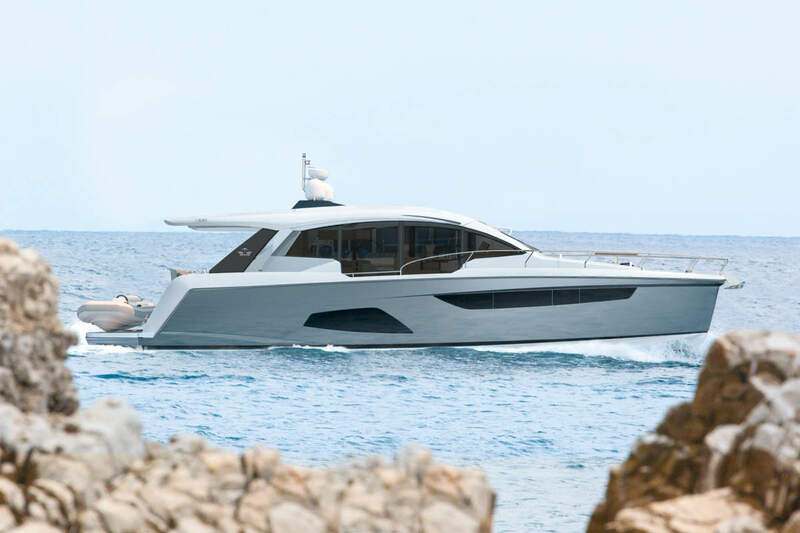 Sealine Yachts have delivered another great addition to the C range and the revival of the brand continues at full steam!